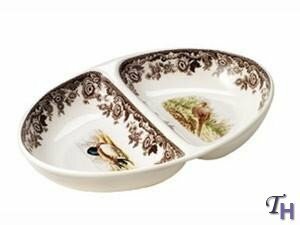 Woodland's Oven-To-Tableware Divided Dish measures 11- 1/2 inch length x 8- 1/2 inch width. The Pheasant and Mallard are the animals pictured on this item. Every image is a genuine work of art, rich in autumn colors with the look of fine hand-painting. Artwork on each piece shows the animal in its natural environment. In Europe, where there has always been great emphasis on the hunting of game and its elaborate presentation on the table, woodland patterns have long been popular. Spode's Woodland pattern is a handsome example of this genre, introduced into the U.S. in 1990. The game animal and bird studies are perfectly framed by the border of stylized flowers in a rich earthtone brown, dating from 1828.